Ceramic or porcelain veneers are what people are talking about when they say they got veneers or when someone famous gets veneers. However, there is a cheaper alternative…composite veneers. There are even circumstances in which composite veneers are a better choice than porcelain. So when does the situation call for composite veneers???? 1. Child or young adult with peg laterals. These adolescents typically wait until done growing to get porcelain veneers. 2. An individual that needs only one or two teeth covered, typically this is also someone with peg laterals. 3. Someone with existing composite veneers that doesn’t want to change to porcelain ones. 4. Someone who cannot afford the porcelain veneers. Some doctors love doing composite veneers and have a lot of their patients get them instead of the porcelain veneers. I am not one of those. I know the downside of the composite veneers outweighs any temporary benefits. I do, however, use them when the situation calls for it. Examples of when I use composite veneers would be numbers 1-3 listed above. I could maybe be talked into #4 by someone, but it hasn’t happened yet. 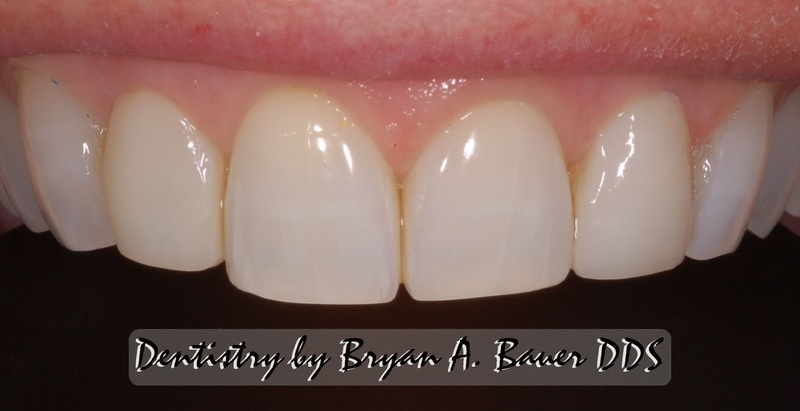 The major disadvantage of composite veneers is that they wear away and start to literally break down. They are also not as strong as porcelain and composite will stain. They do cost less initially, but over the course of a lifetime actually cost more because of the maintenance costs involved. The main advantage in my eyes of composite veneers is that the doctor has total control of the look of them and can easily make changes immediately. When a lab makes porcelain veneers for just one or two teeth, trying to get a perfect match is very difficult and maybe impossible in some cases. With composite veneers the doctor can fairly quickly make a great match to the neighboring teeth. Of course, if you are doing all your teeth this matching is irrelevant. 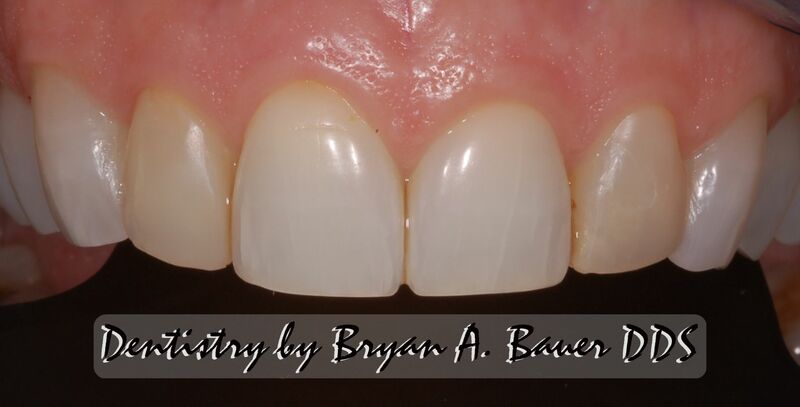 Here is an example of a woman that had her teeth whitened and realized that her old composite veneers were now much more yellow than her natural teeth. So without her even being numb I was able to redo them and make everything match again. If you or someone you love is considering a smile make-over give us a call and come on in and see us for a complimentary consultation. I have spent a lot of time and effort ensuring that I have the best products and techniques in existence so that I can give you the best smile available. Check out my work or check me out at the American Academy of Cosmetic Dentists. Besides the free esthetic consult we also offer complimentary orthodontic consults with my wife, Dr. Danielle Bauer. Call us at 630-665-5550 we would love to help you!